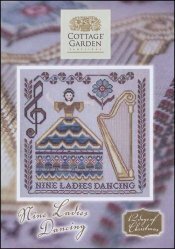 Twelve Days Of Christmas: Nine Ladies Dancing [D6624] - $7.50 : Yarn Tree, Your wholesale source for cross stitch supplies. Part of the 12 Days Of Christmas series by Cottage Garden Samplings. A woman standing next to a harp accented with floral motifs and a music note. Stitch count 145 wide x 145 high.